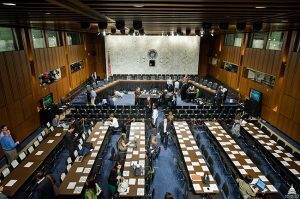 The Senate Judiciary Committee held a hearing this week with top immigration officials, including U.S. Immigration and Customs Enforcement (ICE) and other agencies. Among the biggest takeaways? Jonathan White, Health and Human Services Commander, testified that the government was clearly warned by one of its own agencies that family separation would entail “significant risk of harm to children” as well as “psychological injury,” and yet it moved forward with the policy regardless. Lawmakers pressed immigration officials about the increasing reports of sexual and other abuse at government detention facilities. Among these disturbing allegations, six immigrant teens reported experiencing physical abuse in a shelter in Roanoke, Virginia. Additionally, a six-year-old girl separated from her mother at the border reported sexual abuse in a shelter outside Phoenix, Arizona. ProPublica obtained police reports documenting hundreds of allegations of sexual offenses, fights and missing children. Both Committee Chairman Chuck Grassley, R-Iowa, and top panel Democrat Dianne Feinstein of California addressed the allegations, some of which date back to 2012. In response, ICE’s Matthew Albence said any allegations of abuse in any detention facility are automatically documented and reported to appropriate resources. As immigration officials scrambled to explain the numerous problems that resulted from the policy—including the government’s difficulties tracking down separated families—Sen. Richard Blumenthal, D-Connecticut, asked if any of the officials thought the policy had been effective. “You can just raise your hand, if you think it’s been a success,” Senator Blumenthal said. No one in the room raised their hand. Read more about the Senate hearing here.